It’s rare to find a holiday let finished and presented to such a high standard – far exceeded expectations and highly recommended. Best walks: Glenridding to Howtown (Ullswater) and return journey via steamer boat, and Hampsfell (Grange-over-Sands). Recommended drive: Honister Pass via Buttermere. London Euston to Oxenholme the Lake District – how long? So, taking out the anomalous response (which came with a winking smiley so clearly wasn’t mean to be taken too seriously! ), we have 6 responses totalling 26 hours. This gives an average ‘guestimate’ of 4 hours 20 minutes. It surprises many people that the journey can in fact be completed in just 2 hours 38 minutes. Our friends at beelocal sent us an email today, telling us that Dales Butchers in Kirkby Lonsdale are the latest local supplier to join their ranks. 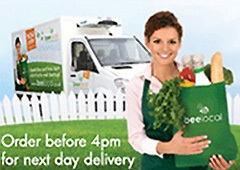 For those that don’t know, beelocal is an online shopping delivery service that specialises in local produce. They will deliver groceries directly to our accommodation to save guests packing provisions or going out shopping the moment you arrive. 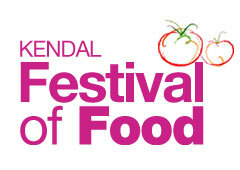 They will also be getting involved in the Kendal Festival of Food which starts this Friday. Those of you that have yet to stay at our riverside apartment – and perhaps many of you that already have – probably don’t know that our balcony not only enjoys a fabulous view down the River Kent and towards Kendal Castle, but it also overlooks the entrance to an otter holt. In order to minimise disruption to the delicate balance of the river’s ecology, the builders of the apartment building put up bat boxes and constructed this artificial holt. As yet, the holt is unused (to the best of my knowledge) but otters have previously been seen along this stretch of the river. 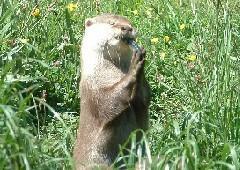 And the good news just in is that otters are currently thriving in the UK. In a report conducted by the Environment Agency (for the full 125-page version, click here), they are apparently “back from the brink of extinction”. The report finds that otter populations in Cumbria have probably reached full capacity, and makes specific reference to “the very clean rivers of Cumbria”. Real Artisan Baking 22nd & 24th October 08:00 to 12:00 – A free demonstration of real artisan baking with Simon Thomas at the Staff of Life Bakery. Tapas, Mezze & More 24th October 09:30 to 16:00 – Come for this full day course with LucyCooks and learn how to put different foods together to provide a fabolous feast of flavours all for £130. Children’s Pizza Making 26th & 27th October 15:00 to 16:30 – Enjoy children’s pizza making, with Chef Martin McMillan, at Infusion Italian Restaurant. £4.50 per child, first come first roll. Forget 5 star hotels, this apartment is so much better – more spacious, more comfortable and with no balcony supplement! Best food – The Dalesman in Sedbergh. Best drive – Hardknott Pass. The evenings cost £19.95pp (with the exception of Christmas which is £24.95pp). Take your table anytime between 7.30 – 9pm and bring your own wine and they will supply wine glasses and corkscrews. Booking is essential with a £5 deposit required. 1 – Preheat the oven to 180C (350F) Gas mark 4. 2 – Heat the oil, adding the onion, carrots and minced beef until golden brown, stirring often. 3 – Stir in the plain flour and then add the beef stock. Simmer for 10 minutes. 4 – Once all this is completed, add the mixture to a suitable ovenproof dish. 5 – Peel and dice the potatoes and cook in boiling water until tender. 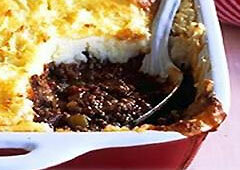 6 – Mash the potato using the butter and use it to top the mince in the dish. 7 – Add your own design on the top using a fork. 8 – Bake in the oven for 40 minutes until nice and golden. McHenry Hohnen Shiraz, Margaret River, Australia supplied by Lakeland Vintners. A rich blackcurrant and red fruit taste, with a hint of leather. Only £10 from beelocal. Remarkable stay in superb apartment. Will not be telling our friends until we have a confirmed re-booking! Your attention to detail is faultless. Recommend the New Moon Restaurant, Highgate.